In which the Seven Thousand Steps live up to their name. The Elder Scrolls V: Skyrim has been remastered and re-released so many times it’s an inside joke at this point, and yet I haven’t really felt drawn to go back—until last night. Last night I once again took that fateful wagon ride through the mountains, put my head down on the chopping block, watched a dragon burn a village down, and helped my ol’ pal Ralof escape from those nasty brutes in the Imperial Legion. Only this time, I did it in virtual reality. 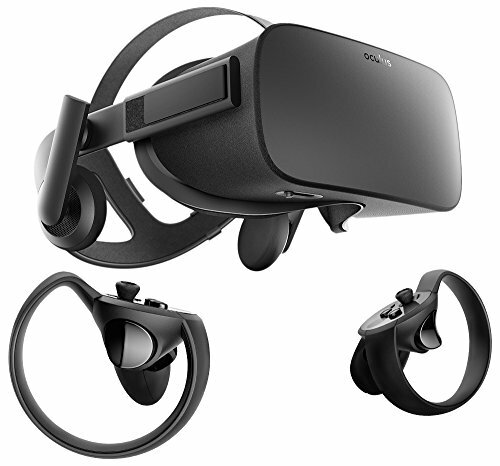 Yes, after six-ish months of PlayStation VR exclusivity, Skyrim VR released on PCs this week ($60 on Green Man Gaming) with official support for both the HTC Vive and, in huge news for Bethesda, the Oculus Rift. I wouldn’t say there’s peace between Zenimax and Oculus, but some sort of detente evidently prevailed finally. In any case, I’m enjoying Skyrim VR so far. That’s not saying much—I’m only two or three hours in. Unlike Bethesda’s other virtual reality re-releases though, Skyrim VR’s gimmick fundamentally changes how the game’s played, and that’s enough to get me to overlook how janky it can be. It’s Skyrim, but you actually swing your sword, shoot fire from your palms, and lob arrows at enemies. That alone has made it more enjoyable to me, giving even Skyrim’s notoriously floaty combat a bit of heft as I thwack my Vive controller into the back of some Legion soldier’s head. Or, you know, the wall. It’s also Skyrim, but life-size. Ulfric Stormcloak is a bit shorter than I thought, and the Seven Thousand Steps a lot longer. Just like in Fallout 4 VR, the sheer size of everything is probably the biggest (no pun intended) difference. I beat that drum a lot with VR, but it’s honestly what stands out most to me when comparing the “standard” or monitor-bound version of a game and the VR version. It’s not like I ever feel something’s missing from the original. For instance, you can easily deduce how large one of Skyrim’s dragons is while playing on a monitor. They’re huge, right? Seeing it in VR though, watching a dragon circle above you or perch on a wall—it’s incredible, and hard to explain. The best analogy I can think of: Compare seeing a photograph of a tall building, like the Empire State Building or the Eiffel Tower or even a 10-story office building in your local downtown, versus standing at the bottom of it and peering upward. Two fundamentally different experiences even though the core architecture is the same. The pictures in this article don't do justice to the game. 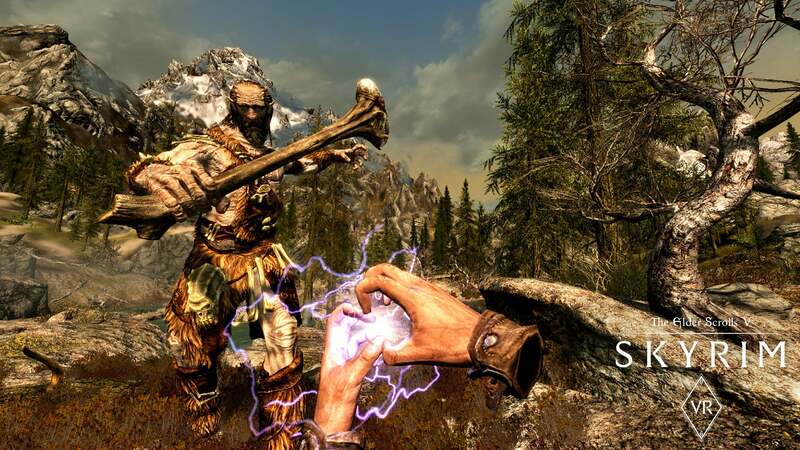 Skyrim VR hasn’t been quite as successful at whisking me away as Fallout 4 VR. 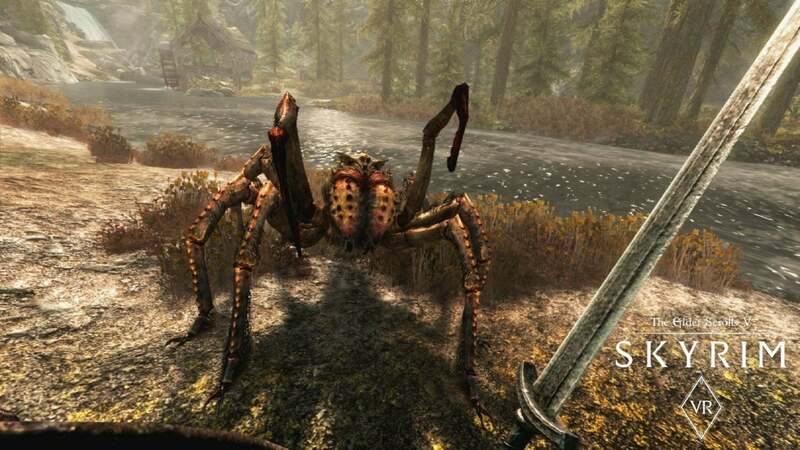 For one, the scale of Skyrim VR seems a bit off. You wouldn’t notice it on a monitor, for example, but a lot of the ceilings are awkwardly low. It’s also very much a game from 2011, by which I mean ugly. Bethesda seems to have used the original visuals as the foundation here, not even the enhanced ones from 2016’s Skyrim remaster. Expect a lot of stretched ground textures, heavily artifacted grass, and so on. I’m not really surprised—as I said, this was a PlayStation VR exclusive first and foremost. Of course Bethesda used the barebones visuals in order to hit a VR-ready frame rate on that hardware. I am admittedly a bit disappointed though, given Fallout 4 looked pretty great in VR. Skyrim VR looks passable at best, even on the highest settings and with supersampling enabled. Luckily you have options. From what I can tell, most base Skyrim mods will work with Skyrim VR too. Like Fallout 4 VR, this is essentially just the real game with a VR patch on top. Thus you can hop over to Nexus Mods and install all the texture and mesh mods your machine can handle, which given Skyrim’s age ought to be quite a few. Also, be sure and turn off Temporal AA and disable the Dynamic Resolution option. Both make the game far blurrier than it needs to be. I also have the usual complaints that stem from Skyrim VR being ported to VR instead of built for it from the ground up. Most of these mirror Fallout 4 VR’s flaws. 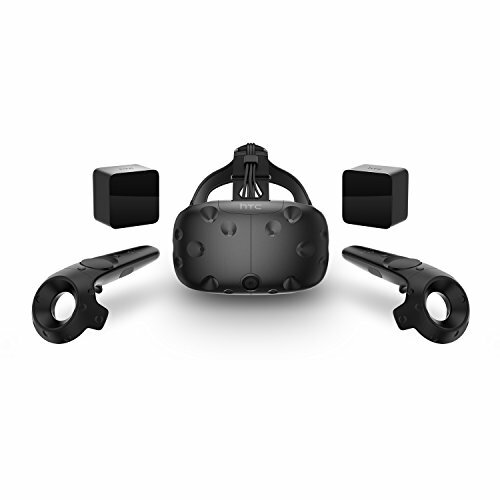 Menus are convoluted, especially on the Vive, where they require lots of imprecise swiping on the touchpads. Menus and dialogue trees also have a bad habit of appearing half-inside other objects, rendering them useless. The teleport system, like Fallout 4 VR, tries to replicate the “stamina” bar from the base game and ends up feeling sort-of broken. It also does that weird thing where when you’re not holding a weapon, sometimes you just see the stock Vive wand models floating in space instead of, you know, hands. I don’t know why Bethesda hasn’t overcome that one yet. Oh, and if you move your hands with a melee weapon in them, even if it’s just to scratch your nose, don’t be surprised if your character lets out a battle cry or a nasty grunt. Perhaps worst of all, savvy players on Reddit noticed Bethesda’s room-scale support is, well, faked. You can move around the space and pick up items, whack enemies with your sword, and so on. However, whether by accident (as a holdover from PlayStation VR) or just because of technical limitations (introduces more problems than it solves), it appears your character’s hitbox isn’t actually moving. To test: Sheathe your weapon, then move towards the edge of the room and look back—you’ll see the sword floating in the middle of the room, where your hitbox is located. This also completely negates the usefulness of a shield, as enemies fire arrows towards the center of your space (where the game thinks you are) regardless of where you’re actually standing. So yeah, a bit annoying. As with Fallout 4 VR though, I’m...enjoying myself anyway. I don’t know. It’s not a good VR experience in the traditional sense. It’s just not. I have another dozen or so complaints I could rattle off in addition to the ones above. Job Simulator or The Gallery or Lone Echo or Arizona Sunshine or, hell, even Google Earth are good VR experiences. They use the technology in smart ways. Skyrim VR, for the most part, does not. Skyrim VR comes at it from the other direction though. There’s a vast and detailed world to discover (or rediscover) here, and Bethesda’s added just enough VR functionality to make it worth exploring. There’s hundreds of hours of adventuring in Skyrim VR, and so far I’ve enjoyed traipsing through the dingy old dungeons and placid stream-side villages alike. It’s even elicited a few “Oohs” from me, particularly the first time I shot fire out of my hands. So simple, but so effective. Skyrim VR even improves on Fallout 4 VR in a few key ways. Skyrim VR’s interface, albeit broken at times, is still easier to navigate than the Pip-Boy’s cluster of tiny menus. There’s also a nifty option that allows you to adjust your height, which Fallout 4 VR desperately needed. Finally, I can look characters in the eye. 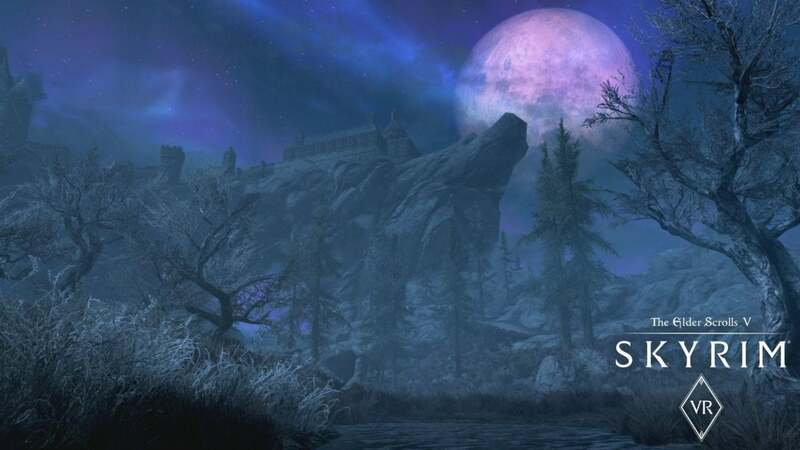 It’s Skyrim in virtual reality. That’s pretty much what it comes down to, and I’m fine with that. Sure, I’d rather a game built for VR. Sure, I wish it were less janky. Sure, I wish melee combat had some of the heft of Gorn. Sure, I wish it looked better. I wish, I wish, I wish. But if publishers aren’t going to fund big-budget VR exclusives, at least Bethesda’s meeting people in the middle. 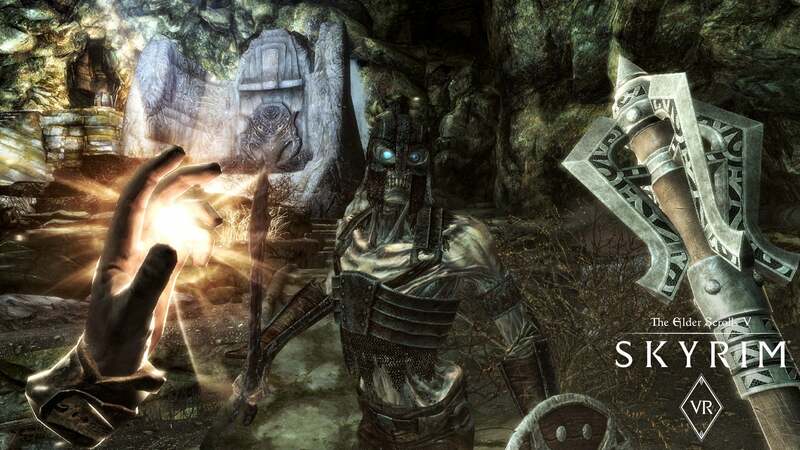 Like Fallout 4 VR, I’d say Skyrim VR is at best 50 percent of the way towards being a good Elder-Scrolls-in-VR, which doesn’t sound great on its surface. On the other hand, 50 percent looks a lot better than that hypothetical VR-exclusive Elder Scrolls Bethesda is absolutely not going to fund anytime soon. That’s about where I land. 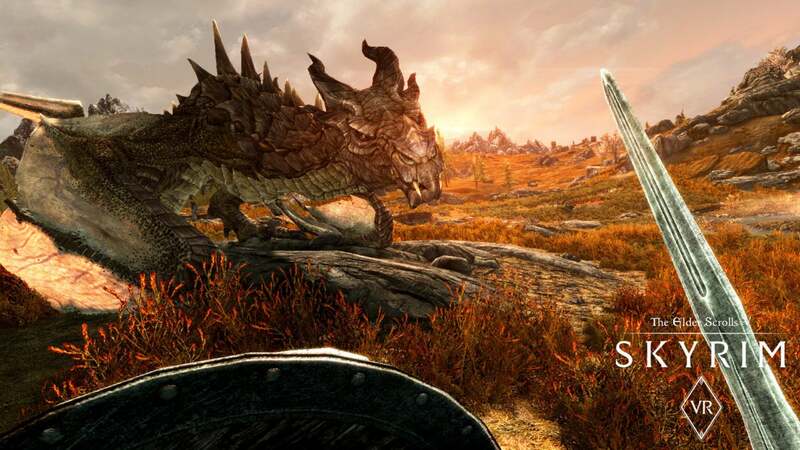 Is Skyrim VR going to change your life? Nah. But it’s a full-size game that adequately takes advantage of the hardware in an age where the number of “full-size VR games” can still be counted on probably two hands. Maybe three hands if we’re being generous with our numbers. That’s enough to get me to pull the arrow out of my knee and go adventuring one more time. 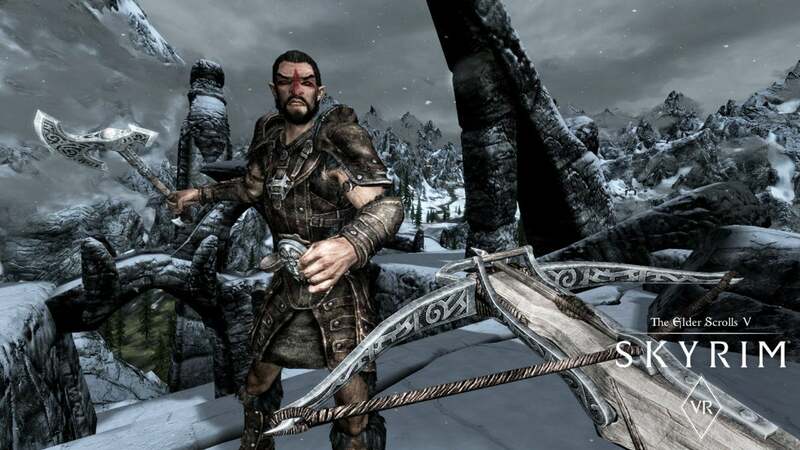 Few other VR games rival Skyrim VR's epic scope and scale, but data graphics and bolted-on VR interface issues are an arrow to the knee. Uses the original 2011 visuals, not the remaster's.